We look a bit deeper into the 2011 recorded music sales revenues in today’s blog. Most of the figures below are gracefully lifted from nielsen SoundScan reports. They claim that these numbers are “compiled from a national sample of retail store and rack sales reports (that are) collected”. These numbers are all year to date from January 1st to November 27th, 2011. With a month to go and the holiday season coming things are looking good! 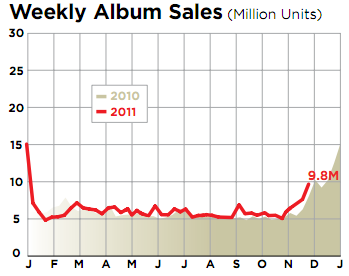 Considering the huge transition to streaming services in 2011, this has been a banner year for track and album sales. Album sales experienced a 2.5% increase to over 278m units sold. CD’s accounted for a staggering 185m (66%) of all albums sold while digital sales accounted for 90m while grabbing 32% of the market. Vinyl grew almost 37% year over year (2010 to 2011) from 2.4m to 3.2m units sold. In a year where Vinyl seemed to be making a “comeback” it still only penetrated 1% of total album sales. The positive is the growth of digital album sales from 74m in 2010 to 90m units in 2011, 19.5% growth year over year. side note: I bought exactly one cd in a record store in 2011; Mates of State’ “Mountaintops”. I bought 3 vinyl albums in 2011, both the Hooray for Earth EP and their latest “True Loves” as well as M83’ “Hurry Up, We’re Dreaming” which are all up in frames as wall art. The majority of digital music I purchased was through iTunes and/or Amazon. A new statistic, to compensate for increasing single sales over the last decade, was created and called TEA or Track Equivalent Albums. TEA sales are calculated as 10 track downloads which are equal to one album sale. Using this number, TEA albums are up over 4% from 374m to almost 391m units sold. Individual digital tracks were up almost 10% this year from 1.02b to 1.12b units sold. CD singles, grab 1/1000th of a percent of total unit sales at 2.2m units sold and experienced a 9% growth year over year. Somehow the heart is still beating on cd singles, and growing! Overall, this has been a great year for recorded music sales, according to nielsen. With the addition of cloud services from Google, Amazon and iTunes, digital music is more accessible than ever before in the history of the music business. It will be very interesting to see how much streaming services cannibalize iTunes and Amazon, as well as Google, purchases over the next 12 months.